.Copyright © Houghton Mifflin Company.All rights reserved. 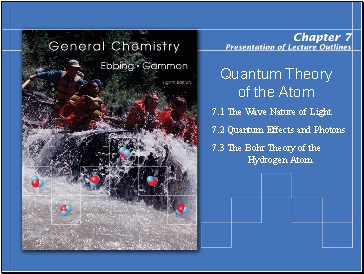 A wave is a continuously repeating change or oscillation in matter or in a physical field. Light is also a wave. 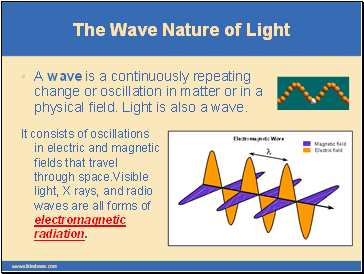 It consists of oscillations in electric and magnetic fields that travel through space.Visible light, X rays, and radio waves are all forms of electromagnetic radiation. 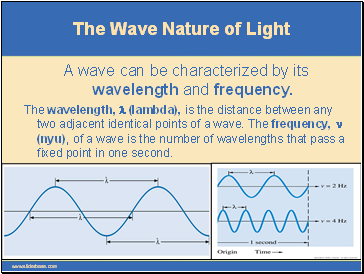 A wave can be characterized by its wavelength and frequency. The wavelength, l (lambda), is the distance between any two adjacent identical points of a wave. 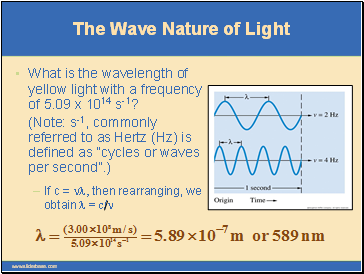 The frequency, n (nyu), of a wave is the number of wavelengths that pass a fixed point in one second. 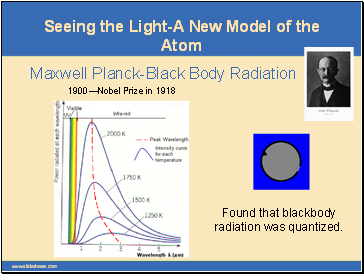 So, given the frequency of light, its wavelength can be calculated, or vice versa. 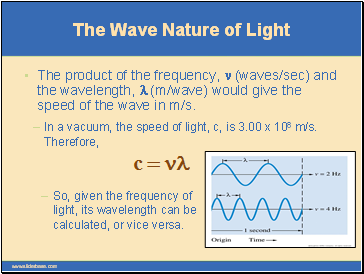 The product of the frequency, n (waves/sec) and the wavelength, l (m/wave) would give the speed of the wave in m/s. What is the wavelength of yellow light with a frequency of 5.09 x 1014 s-1? 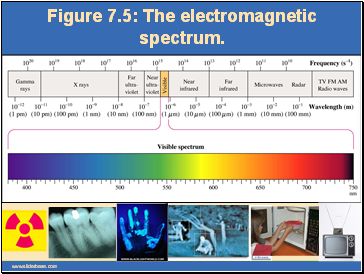 Figure 7.5: The electromagnetic spectrum. If c = nl, then rearranging, we obtain n = c/l. 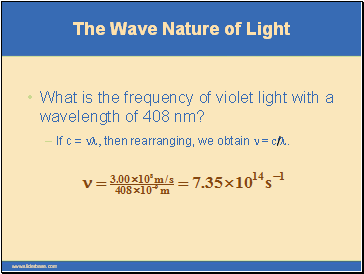 What is the frequency of violet light with a wavelength of 408 nm? Copyright © Houghton Mifflin Company.All rights reserved.